Stanley Rosen’s Nihilism is a key book for understanding the nature of the Western Worldview. Both Heidegger and Nietzsche make Nihilism a center piece of their philosophies. Rosen pursues the nature of nihilism by contrasting the philosophies of Heidegger and Wittgenstein as Nihilistic opposites. Nihilism was originally coined as a term by Turgenev in Fathers and Sons, where it basically meant how youth who embraced science did not appreciate traditional norms any longer. From there the meaning of Nihilism morphed into a position that everything was meaningless and basically took the place of skepticism as the strawman to be discredited by philosophers. Nietzsche was the first one to attempt to show it was a central feature of the western worldview, and Heidegger took this up and specified that it was the essence of technology. Once we begin to understand nihlism we can see that it is one of the core phenomena generated by the Western worldivew, and that it is itself the nihilistic opposite of Emergence. In order to understand this nihilistic and emergent duality of emergence and nihilism within the western worldview we must appropriate the meaning of nihilism, and it seems to me that Rosen has the best definition. Basically Nihilism when two antagonistic forces in society that produce a dynamic of conflict are recognized to be exactly the same thing. If you were caught up in the conflict and suddenly looked at the enemy and said “we confronted the enemy and we were them” then that would be a loss of meaning in your world. This is precisely what happens to Achilles in the Iliad when he realizes that the Greeks are no better than the Trojans when Agamemnon takes his war prize Briseis. He withdraws from the conflict, but then when his friend Patroclus is killed he goes into a berzerker state. Both of his reactions are themselves nihilistic. Thus the Iliad functions as a users manual for living in a Nihilistic worldview. It also tells us about the nature of emergence. And so this fundamental duality is at the core of our epic tradition and needs to be understood by those encompassed by the Western worldview. 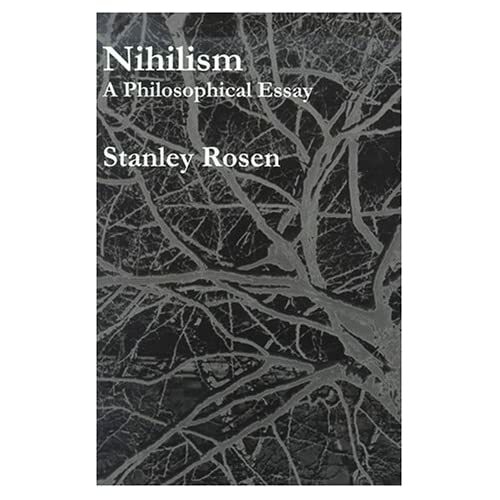 Stanley Rosen’s book on Nihilism clarified the philosophical meaning of this term so it can be a basic tool in our attempts to understand the Western worldview. Quora answer: How has monotheism affected a civilizations’ ability to progress in science? This is actually a complicated question to answer because so many things are being assumed in the question and the first anonymous response which I take to be the questioners further explanation. However, the question itself does beg for an answer. Is Monotheism a precursor for Modern Science and our progress in it which has changed the world so much? 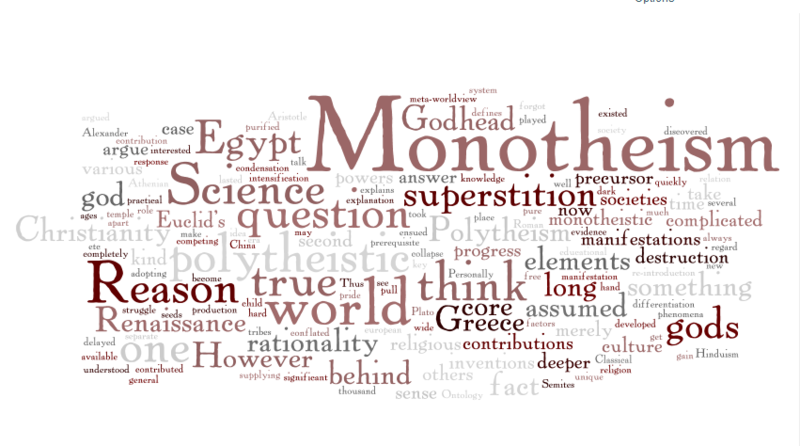 This core question is pretty significant if it were true, that monotheism was a prerequisite. Personally I don’t think this is so. And my evidence for that is that China discovered everything that was available in the Renaissance a thousand years earlier and then forgot them again and again. The real key to progress (or regress, as it may be) is not forgetting and adding various inventions on to each other to produce new inventions. This is something that Indo-Europeans managed to do, and I think the concept of Being, unique to them, has something to do with their success in this regard. I think Being is a precursor. In other words I don’t think it is the semitic contribution of monotheism that is as important. However, there is no doubt that it played a role by supplying through synthesis the idea of the Supreme Being when Monotheism and Ontology are conflated. But these are the contributions of the two nomadic tribes in the Middle East. But there are also the contributions of Egypt and Mesopotamia, which we are just now starting to appreciate, because it had been lost for so long. All of these factors contributed to the foundations of Science through the production of a meta-worldview, which we now live in as the world wide dominant worldview which is quickly supplanting all the others. It could be argued that Science would not be what it is if it did not have to struggle against Christianity. And it is certainly true that Reason defines itself against the superstition of religion. But the fact is that Reason existed in Plato’s academy which lasted for a long time, and through Euclid’s elements persisted to become the core of the educational system in the West. In Euclid’s elements we get a condensation of the knowledge of Being and its relation to rationality. But it took a long time for rationality to show the kind of results in science that would allow it to pull free of religious superstition. But on the other hand, rationality itself fully developed in a Polytheistic society. One could argue that Christianity merely delayed the rise of Scientific culture though the intensification of superstition after the Roman era. The seeds were sown by the take over of the world by Alexander which seeded Athenian Greek culture across the known world. But Romans were not interested in theory, but only practical applications, and when Rome fell apart after adopting Christianity, then the dark ages and general european collapse ensued until the Renaissance when there was a rediscovery of the Classical past in which Reason was given pride of place within a polytheistic context. Thus one could argue that Reason is the child of Polytheism and that it was only with the re-introduction of polytheistic elements during the Renaissance that that Reason could gain a foothold again, as something other than a support to religious superstition. However, it is way more complicated than that, because polytheistic societies like Greece and Egypt, were in fact really monotheistic at core, which we see in Plato and Aristotle where they talk about God and the gods. It was assumed in those societies that there was a Godhead, and that all the gods were merely manifestations of that godhead. So it is not even true that Egypt and Greece were completely polytheistic because they understood well that there was one god behind the various manifestations of that reality behind the appearances of the gods. And so we could make a case for the fact that Greece and Egypt were monotheistic in a sense similar to that of the Semites up until the second destruction of the temple. After that second destruction Judaism purified its Monotheism and that is when radical monotheism with one god and no others entered the scene. But before then it was always assumed that beyond polytheism there was a deeper monotheism. Same is true in Hinduism. Polytheism is itself not pure, but a kind of Monotheism that allows differentiation into gods who manifest the powers of the hidden single Godhead (Brahman) behind all the phenomena of its manifestation in the world as separate powers and attributes which explains why the world is such a mess, where evil came from etc. So I think this is a question that could have several competing answers and it would be hard to disentangle what the true precedents are for science. Monotheism in this deeper sense can be one of them, but it is not clearly the case. Quora answer: How long does it take to write the first draft of a book? 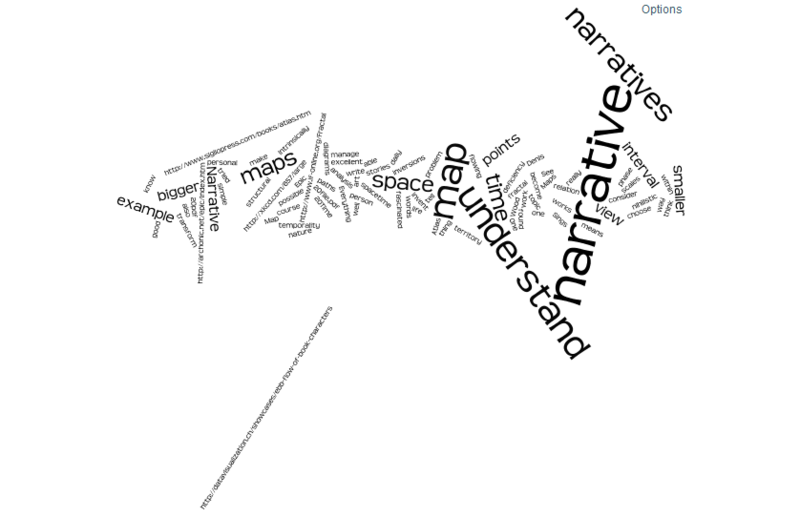 I wrote the first draft of my dissertation Emergent Design at http://emergentdesign.net in six weeks. Then it took ten or eleven months to rework it so that the english was acceptable with my wife as my editor. We argued over every sentence. After I was done I did a diff between the original draft and the final passed dissertation, there were a few words that went untouched, like I noticed that the phrase “In other words, . . . ” on one page remained untouched throughout the editing process. Not sure how those words were spared. Quora answer: What does it take to be a prolific writer? I am a prolific writer. Prolific does not necessarily mean a good writer, as my wife keeps reminding me. But there is a certain point when one begins to be able to just set down and start writing. Taking that stream of consciousness and making it into something worth reading is then a lot of work, which I do not do except for things that are published. So I have a lot of very doubtful writings on my web sites and what is available (over 10,000 pages) is just the tip of the iceburg of what exists off line or in manuscript form. Writing is my way of thinking things through. I learned to write working papers in college, and never stopped. I also learned to do diagrams as the basis of my thinking. When you combine that with a lot of reading, almost ten years sitting in the British Museum reading everything in Philosophy and myriad other subjects I could get my hands on, and almost every book that existed was available there, then eventually you think you might have something to say. I know, I know that is all illusory. But it keeps me going, now writing answers on Quora, as an advertisement of my more serious works available on my web sites. 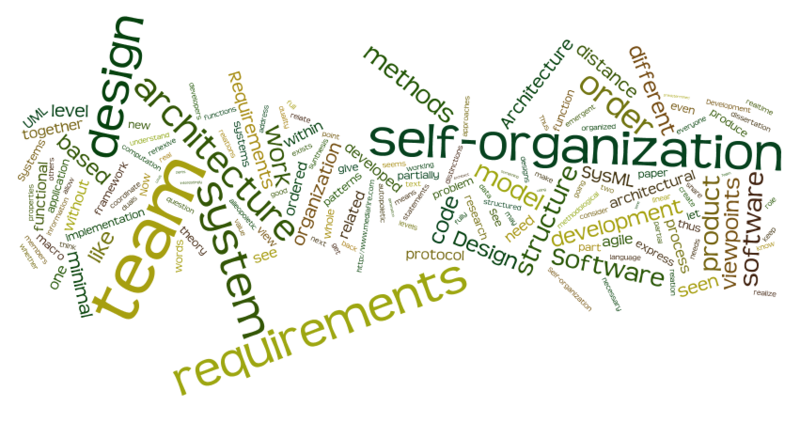 I tried going to conferences but that did not work, so here I am slaving away answering questions on Quora in hopes that someone out there will find Special Systems and Emergent Meta-systems interesting. At a certain point I became fluent in my writing. And after that all I had to do was sit down and start writing. As I write I discover things that I did not know before, and that gives me the elevated interest and really fascination or thrill of discovery that leads me to read on in the myriad subjects of my interest, which is fairly wide. I will never forget after I received approval for my Ph.D. in England which took about nine years, all my Advisor had to say was, now you have a general education. In other words he was saying, you are just beginning, and you now have the basis for going further and doing your own research on your own. One thing leads to another and after a while you have read a lot of pages and written a lot of pages in response to what you have read. And years have gone by. Some parts of life you missed out on, myriad parties I suppose. But on the other hand when all is said and done, a little knowledge goes a long way. My favorite book along these lines as I have mentioned previously is Knowledge Painfully Acquired by Lo Chin Shun. There is someone who spent their whole life thinking very deeply, who came to a conclusion after myriad avenues explored, and set his conclusions down succinctly as a guide to others. Being prolific but not being a very good writer has many disadvantages, one of which is that your work does not get read even if it deserves to be read. So my advice is to learn your lessons well, and then strive to become prolific after becoming proficient. Those who become prolific prior to becoming proficient are doomed to fail even if their ideas are very good. However, failure in terms of getting attention should not be counted as overall failure. The actual reward is in the discovery process itself. The thrill of the chase in to a territory never visited by anyone else, not mapped out, and with no beaten tracks. It may be rare in the earth, but in the landscape of ideas there are still many continents left to discover, and there the local inhabitants do not mind.